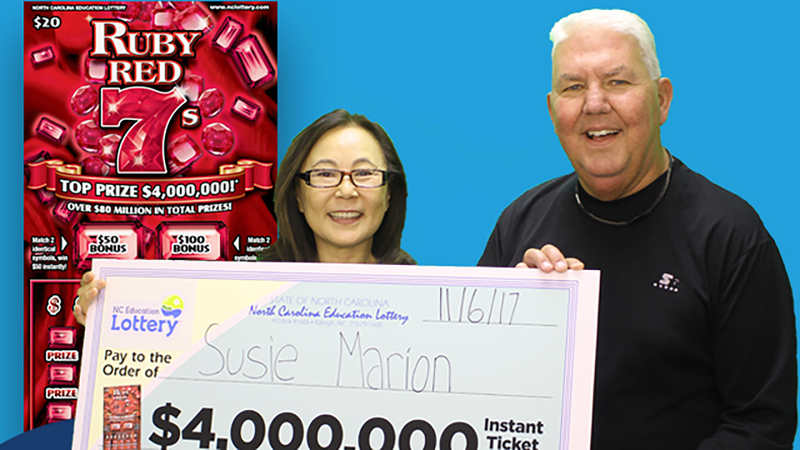 GARNER, North Carolina (WTVD) -- For Susie and Dennis Marion of Garner, their ordinary morning routine instantly turned extraordinary when they got a Ruby Red 7's scratch-off ticket and won $4 million. "In the mornings, I go and get a scratch-off ticket while Dennis goes to Bojangles and gets a bacon and egg biscuit," Susie said. That's exactly what they did Monday morning. Dennis went to get his breakfast while Susie stopped at the Breeze Thru on N.C. 42 West in Garner. She decided to get a $20 Ruby Red 7's scratch-off ticket. At first, Susie didn't think she'd won anything. "I scanned the ticket to check and it said, 'Go to lottery headquarters,'" Susie said. "I asked the clerk what I'd won and he told me, 'I think you just won $4 million!' I couldn't believe it. I was shaking and started crying. It didn't feel like it was possible." Susie immediately got her husband, a retired Marine veteran, and showed him the tickets. "I couldn't believe it," Dennis said. "It felt incredible. It couldn't come at a better time." Susie and Dennis drove straight to lottery headquarters in Raleigh to claim their prize. They had the choice of taking a $4 million annuity that has 20 payments of $200,000 a year or a lump sum of $2.4 million. They chose the lump sum. After required state and federal tax withholdings, they took home $1.67 million. They plan to use some of the money to go on a dream vacation to Hawaii. "I've wanted to go to Hawaii for quite a while," Susie said. "We're going to take the grandkids. It's going to be a great time." Ruby Red 7's launched in June 2016 with three top prizes of $4 million. Susie and Dennis won the last top prize in the game.